Welcome to this spacious, immaculate, and air-conditioned condominium overlooking the Mediterranean Sea. The condo is centrally located and within walking distance to the ancient city of Ortigia (15 min walk). The surrounding area includes important historical areas, fountains, open markets, cathedrals and marinas/ports. Did I mention the property also provides a private swimming area directly below the condo? Parking can easily be found within the condo gates or on the main road. The condo integrates fabulous antique furnishings and is filled with original works of art. Floor to ceiling french doors lead out to the wrap around balcony over the water - you can enjoy a cup of coffee or glass of wine while watching the sun glisten over the water. Please do not hesitate to contact - We are always available to assist in any way we can to provide the best stays for our clients. Accessible from EVERY room in the condo. I stayed for about a month in March of 2019. The apartment is as shown in the photos, It was plenty of space for 4 people, we did not feel like we were crowed at all. Beds were comfortable and plenty of space in each bedroom to unpack and hang up or put cloths in dressers. Red bathroom has plenty of space to put all your toiletries! The wifi was fine and all cooking essentials were provided. Great little cappuccino maker! Kitchen was well equipped. The door keys were a little tricky at the beginning, both the door and entry to the building key had to be turned a "little extra to the right"! The views and access to the balcony were wonderful, none of us could get enough of the view and the little fishermen who came out in the early mornings and sometimes at night. Be aware that the street outside going toward Ortiga appears to be an "up and coming" area, but one might be put off by the dirt and dog dodo on the streets. But once you open the door to the apartment all this fades away! This condition is "not" the problem of the owner, just a heads up to those renting. Giulia was very responsive to all our inquiries. She willingly scheduled a taxi for any and all of our needs. The bus stops are near by, but we never did figure out the local buses, or their schedules. A bus ticket to another town has to be bought at the bus station kiosk. The hop on/hop off bus was not regular, that we could figure out, and it may have been too early in the season for a routine schedule. We walked everywhere, which was fine with all of us. It took about 10-15 min. to the local grocery store, 15-20 to go into Ortiga, 20 min. walk to the Archeological Museum and a few more to get to the Archeological Park (both worth seeing), and 20-30 min to walk to the train and bus station (near each other). There is a small kiosk at the bus area where we bought tickets, but be aware, you can only pay cash and buy the ticket on the day of your travels. Also the kiosk is not always open, but will open about 30 min. before your bus time (I think). The buses are much more comfortable than the train and take you closer to some of your desired stops than the train. We were able to see the bus and train schedules on line, but were unable to buy bus tickets on line, not sure about the trains. Trains are easy as well, but older and some are covered with graffiti. Overall, I highly recommend this location. We came to visit our son. The location of this apartment was perfect for the things that we wanted to do. It was just a 15 minute walk to Ortigia. There was plenty of space in the apartment where we never felt like we were on top of one another. My son came and stayed with us a few nights. The view is beautiful. We plan on coming back and hope that this apartment is available when we return. The owner made picking up the keys and instructions of the apartment very easy. For what we would have spent on a hotel with much less room it was worth every cent. Thank you for your kind feedback. 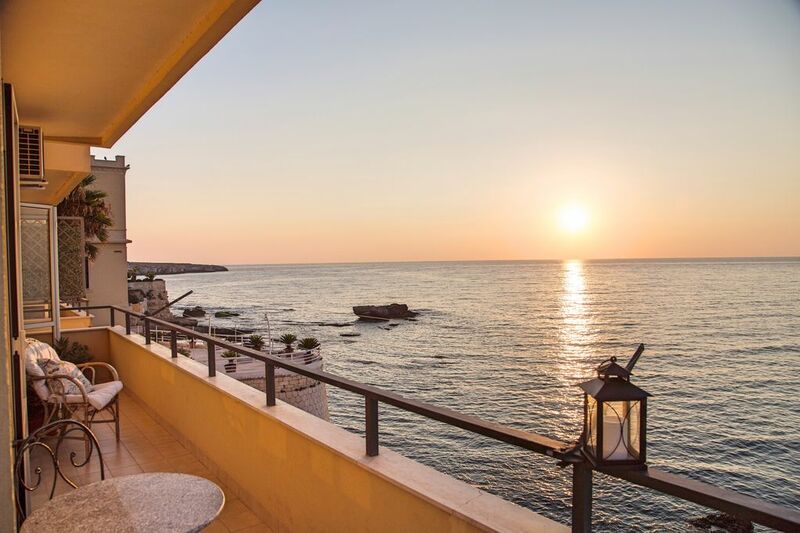 I'm so happy you enjoyed your stay at Stunning Views in Siracusa, Italy. You are welcome to come back anytime! Well-appointed apartment within walking distance of Ortygia. Our party of three 60+ year olds enjoyed this apartment for five nights in early October 2018. The sea was right below us, Ortigia was a 20 min walk away, and we even walked to the Greek theater, though many would prefer taking the Hop On Hop Off bus which had a stop near us. The apartment had everything we needed, even bubble wrap for protecting the ceramics we bought in our day drives to Noto and Tamorina. The kitchen was the best stocked I’ve ever seen for a rental though we lacked laundry soap and binoculars would have been nice for watching the snorkelers and the fishing boats. Maybe I’ll bring them next time. Hopefully there will be a next time as we loved Sicily! Located in a 60's apartment complex right on the water, this huge apartment with a spectacular view of the Mediterranean is located just 30 minutes by foot away from Ortygia (the historic center of Syracuse,) and makes a great base from which you can explore eastern Sicily. There is parking in the narrow alley alongside the building, but if it's full, it is surprisingly easy to find parking on the street. The oven door doesn't close completely, one of the toilets runs constantly and one of the showers is full of mildew. The apartment, as well as the building in which it is located, could use bit of an upgrade. Thank you for your review and feedback. We are very sorry for these inconveniences. It is a pleasure to inform you, however, that we’ve fixed/repaired all of these issues stated in your review. We’ve also had new professional pictures taken of the condo in order to ensure the best stay/experience at Stella Sul Mare. Feel free to take a peek at our new photos and repairs! Thank you again for your feedback/review. It is much appreciated as we continue to offer our beautiful home to future renters. One could not ask for more: a comfortable, stylish well maintained apartment, overlooking the sea. with a stunning view of Ortigia. It lived up to everything in the description. We were met on arrival (76A is a little hard to spot from the road but it is just past the bus stop) and quickly felt at home .Guilia phoned us during the week just to make sure everything was OK, but she need not have worried. The only downside was that Ortigia with its restaurants, market and shops was a good fifteen minute walk and our septuagenarian legs required a taxi back, especially when laden with shopping. (wine bottles can be heavy ) The taxi cost about 10 euros but worth every penny. We should certainly be very happy to stay there again, which is the best recommendation one can give. This condo was absolutely fabulous! It is decorated beautifully and spotlessly clean. The most amazing feature of this condo is the gorgeous water views from every window. The wrap around balcony allows you to sip your coffee in the morning as the sun comes up over the water and sip your wine in the evening as you watch the dazzling sunsets over the blue green sea every night! We enjoyed the wonderful location, walking to Ortigia every day. We also appreciated the fact that there is a bus route to so many locations in Sicily so close by. We rarely needed a car. It is perfect for two couples, as there are two bathrooms. Loved it and plan on returning this year for our "Italian Holiday"! Can't wait!